Genoa is a fitting location for the Galata Museo del Mare, as the city has been a major maritime power for centuries. The Museum of the Sea’s four floors feature numerous exhibits on sailing ships and sea explorations—including an entire room dedicated to the famous Genoese explorer Christopher Columbus and his Transatlantic voyage. The Galata Museo del Mare is housed in the oldest building in the Darsena (area of the Old Port), and its name is a nod to the old Genoese quarter in Istanbul, which was a part of the Genoese Republic from the 13th to 15th centuries. In addition to the 28-room museum, there is an open-air area where you can explore the inside of an S518 Nazario Sauro submarine. Most tours of the Old Port include a visit to the Galata Museo del Mare along with the adjacent Genoa Aquarium. Also available are combo tours that take in several port attractions including the panoramic lift, the biosphere, and the S518 Nazario Sauro submarine. The Galata Museo del Mare is a must-visit for history buffs, especially those interested in maritime history. Book a skip-the-line ticket to save time. Guests typically spend about three hours exploring the main museum and the outdoor submarine. Head to the top floor of the museum for some of the best panoramic views of Genoa. The museum is fully accessible for those with vision and hearing impairments, with tactile guidance and amplification devices available. The museum’s main building is fully wheelchair accessible, however the outdoor submarine is not. The Galata Museo del Mare stands in the middle of Genoa’s Old Port, Porto Antico. Take the train to Piazza Principe or the metro to Darsena, both a 5-minute walk to the museum. If driving, there are a few paid parking lots in the area. The maritime museum is open 10am to 7:30pm daily from March to October; from November to February it’s open 10am to 6pm Tuesday through Friday and 10am to 7:30pm on weekends and holidays. It’s best to visit the museum—one of Genoa’s most popular attractions—before lunch to avoid large crowds and enjoy a more contemplative experience. This section of the museum is very popular among visitors. More than 40 multimedia stations showcase Italian emigration by sea and the recent immigration to Italy. You can see reconstructions of Italian immigrant areas across the world, such as La Boca in Buenos Aires and New York’s famous Ellis Island. Buy your Galata Maritime Museum admission ticket in advance to skip lines and maximize your time in the exhibits, which include Christopher Columbus’s original manuscripts and a 4D shipwreck reproduction. After you learn about the little-known history of Italian seafaring, climb to the top floor for panoramic views of Genoa’s cityscape. Your ticket includes free coat check. Explore several of Genoa’s famous attractions for one price with this combination ticket. Visit the Genoa Aquarium, Tropical Garden, Panoramic Lift, and the Biosphere at your leisure, as the ticket is valid for one year after first use. Learn about a variety of animals and their ecosystems at these family-friendly attractions. 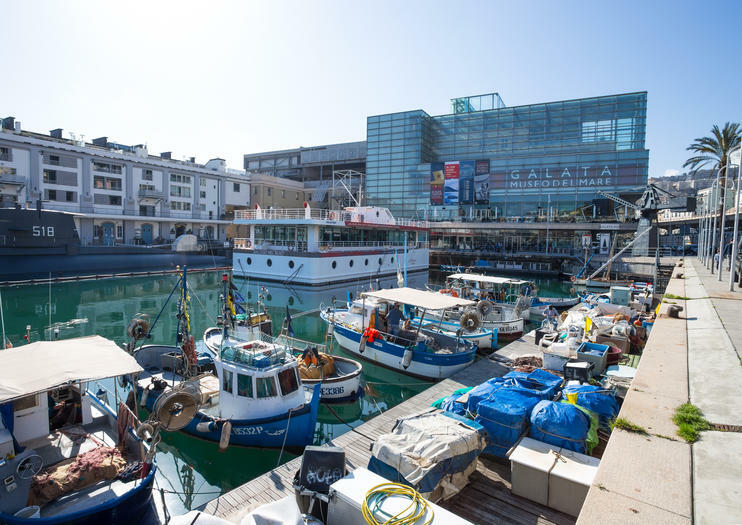 See three of Genoa’s most popular attractions, and discover at your leisure, when you book tickets to the Genoa Aquarium, the Galata Maritime Museum, and the accompanying S518 Nazario Sauro Submarine. Secure your admission in advance, and then choose when you want to visit: tickets are valid for up to one year, so you have the ultimate flexibility in planning your sightseeing. Embark on a unique and interactive experience when you visit Genoa’s Dialogue in the Dark. This sensory exhibition is held, as its name suggests, entirely in the darkness. With just a small group accompanying you, and led by a blind guide, you’ll try out a number of interactive activities, will rely on your other four senses, and may even experience a deeper shift in perception. sail with us on the sea mammals’ routes in the Pelagos Sanctuary and live a marvellous full-immersion in the dolphins’ world! The boat excursion departing from Genoa, from the pier next to the Aquarium, lasts 4 hours and entails the search and sighting of sea mammals in their natural habitat! Guiding the public through this unique experience is a marine biologist who during the excursion unveils to the participants all the secrets of the animals spotted, illustrating the correct behavioural conduct for the observation of the Cetaceans without disturbing them. Galata Maritime Museum was opened in 2004, when Genoa was awarded European Capital of Culture. It’s the major maritime museum of the Mediterranean Sea and it allows to explore the history of navigation. The exhibition begins on board a Galley, where the “visitor-actor” can explore the Arsenal and find out more about the life of slaves, convicts and the so-called buonavoglia, paid volunteers. Enter Genoa Aquarium to discover the best of Europe’s enchanting marine world. Home to countless specimens of sea life, the aquarium is Italy’s largest, and showcases both rare and well-known species alike. Skip past any admission lines when you enter, then spend as long as you like inside the attraction, discovering manatees, seals, penguins, sharks, and more. It's a treat for all the family. Aquarium of GenoaThe Aquarium of Genoa hosts the most extensive range of aquatic biodiversity in Europe. The exhibition gallery consists of over 70 exhibits and about 12,000 specimen of 600 species, from all the seas of the world.Genova city tourYou will be guided through the naroow alleys (Caruggi) of the widest historical center in Europe, to discover its many curiosities and secrets.The tour starts from the Old Port area and guides you through the highlights of the city, including the San Lorenzo Cathedral, the Doge Palace, the Opera House, and the wonderful Strada Nuova Museums. The Aquarium of Genoa hosts the most extensive range of aquatic biodiversity in Europe. The exhibition gallery consists of over 70 exhibits and about 12,000 specimen of 600 species, from all the seas of the world. From the rarest species such as manatees – marine mammals that may be at the origin of the legend of mermaids – to the most famous ones such as dolphins, penguins and sharks – the great predators of the sea; but also jellyfish, seals and multi-coloured tropical fish species.Come with us in a journey that will fill you with a range of emotions and inspire you to respect deeply the sea and its extraordinary inhabitants. A guided tour of some of the most sumptuous residences built by the aristocratic Genoese families during the so-called “ Secolo d’Oro“ (“The Golden Century”), between the 16th and 17th century.The System of the “Palazzi dei Rolli” includes splendid palaces with open staircases, courtyards and loggias overlooking gardens. The palaces, positioned at different levels, were part of a network of public hospitality houses for state visits, as decreed by the Senate of the Republic of Genoa in 1576.The Aquarium of Genoa hosts the most extensive range of aquatic biodiversity in Europe. The exhibition gallery consists of over 70 exhibits and about 12,000 specimen of 600 species, from all the seas of the world.